Today’s look i wore my Sailor Moon t-shirt with a light polka dot skirt from Zara and my Jeffrey Campbell Tardys boots, a cute outfit for the extremely hot and sunny (as you can see on the photos!) weather. It was perfect until a few hours later when the weather decided to drastically change and it started to rain, freezing cold rain! :( Luckily we had an umbrella to protect ourselves from it. And my boots seem to have survived the rain this time hehe. You are awesome. I've loved Sailor Moon since I was a kid! I could marry you! I LOVE THAT SHIRT! 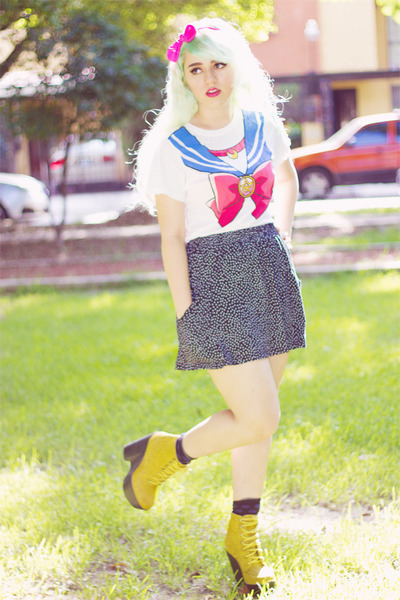 I need a Sailor Moon t-shirt asap. awesome outfit .. Your hair is stunning ! Awesome t-shirt!!! Looooove this look!!! So cute! Cool boots, mama!